MWC 2017: Alcatel A5 LED launched as the world's first interactive LED-covered smartphone. Alcatel today announced the launch of A5 LED at Mobile World Congress. 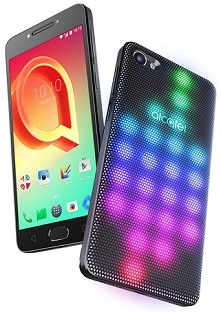 Alcatel's A5 LED is the world's first interactive LED-covered smartphone. The Alcatel A5 LED fits comfortably into the hand, with an ergonomic design that boasts a slim profile and rounded edges. The A5 LED also gives you a great multimedia experience. It has fast 4G LTE connectivity and an octa-core processor that ensures photos, games, and movies load smoothly to the large 5.2-inch HD display. + Light up your notifications with a different light show for important incoming calls, messages, alarms, and social media alerts. + Light up your life using Color Catcher 2.0 by creating unique LED cover patterns and themes for a different look every day. + Light up your imagination with an eye-catching personalized light show. + Light up your music, with light shows that move with your tunes, switching with a simple shake.